^ Boyer, Mike. Ford motored into Cincinnati long ago. The Cincinnati Enquirer. 1998-05-10 [2014-08-23]. ^ Ford Model T Plant. Cleveland Historical. [2014-08-23]. ^ Ford Model T Assembly Building. MotorTexas. [2015-08-04]. ^ Darbee, Jeff. City Quotient: I often smell something like vanilla cookies or cake when walking Downtown. Am I just hungry, or is that for real?. Columbus Monthly. July 2014 [2014-08-23]. ^ Ford's System of Branch Assembly Plants. [2015-09-15]. 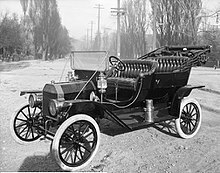 ^ Early Ford Models 1903 - 1908. [2006年12月13日]. （原始内容存档于2007-02-09） （英语）. 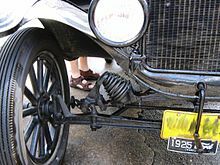 ^ 7.0 7.1 A Short History of the Model T Automobile. [2006年12月13日] （英语）. ^ Ethanol Vehicles. [2006年12月13日]. （原始内容存档于2007年8月9日） （英语）. 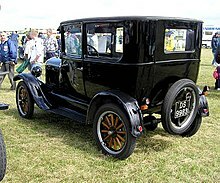 ^ 13.0 13.1 A brief description of the Model T Ford of year 1926. [2006年12月13日] （英语）. ^ The Rouge plant -- the art of industry. [2006年12月13日]. （原始内容存档于2012年9月1日） （英语）.